Free download The Bat! Home and Professional Edition latest version from direct download link. The Bat! is secure email client software, built to protect your correspondence against third-parties. The Bat! protects your information through multiple encryption streams with the options to encrypt your emails on disk and during communication through an SSL/TLS connection. Free of global email providers that keep your messages in the cloud, and free of Web clients, The Bat! ensures your data stays private. The Bat! Windows mail client is able to process and store an unlimited number of messages and has no restriction on the number of email accounts you can use. The Bat! email client protects your personal information thanks to its widespread support of authentication protocols and encryption while working with mail servers. It prevents intentional data distortion and loss of confidential data while sending messages via the Internet. The program’s internal PGP implementation based on the award-winning OpenSSL lets you encrypt messages and sign them with digital signatures. Handy manager for digital keys is included. PGP up to version 10.0.2 is supported. The Bat! also supports S/MIME via Internal Implementation or Microsoft CryptoAPI. Protect against data loss with The Bat!’s backup and restore function for your emails; backup your customized configuration settings, address books, folders and messages. Viruses extract and distribute your contacts’ data from some email address books. 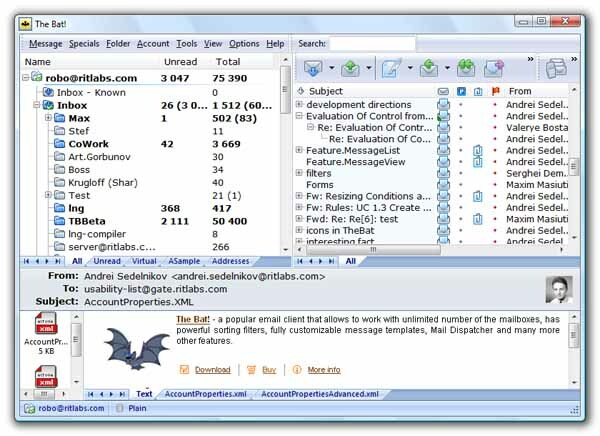 Unlike other email programs, The Bat! uses its own address book which is not connected to virus targets such as Microsoft Windows Address Book. Don’t lose important messages; when a message is parked, you will not be able to move it to another folder, and it won’t be deleted without a warning or automatically purged. View links and HTML content without launching a web browser. The Bat!’s internal viewer supports HTML 4.0 and CSS v2.0 formatting, but ignores scripts and executable code preventing viruses from launching. The Bat!’s internal HTML viewer blocks viruses that use the known HTML vulnerability of Microsoft Internet Explorer (such as IFRAME and Automatic Execution of Embedded MIME type).